Use this FREE utility to monitor your local channel for hostiles as well as the local chat for keywords. There are times when you have to go semi-afk or you just are too sleepy or too tired to have your eyes on local channel all the time. H-Bot LocMon will sit in background and monitor the local channel of EVE. It displays the total number of pilots in solar system, the number of friendlies, hostiles and neutrals. On hostiles there are options to just alert with a sound or exit EVE after some seconds. You can set some keywords and get a sound notification when they are typed in local. Both Pilot's name and the text he types in local is checked so for example you can add a pilot's name to the keywords list and when this pilot types anything in local you'll hear the alarm. Another example is adding words like "Hello", "Hi", "o/", "Hey" etc. so you get alerted when someone greets you. Keywords are not case sensitive so you just need to input each word once. You can stop the utility at any moment by pressing the [stop bot] button. 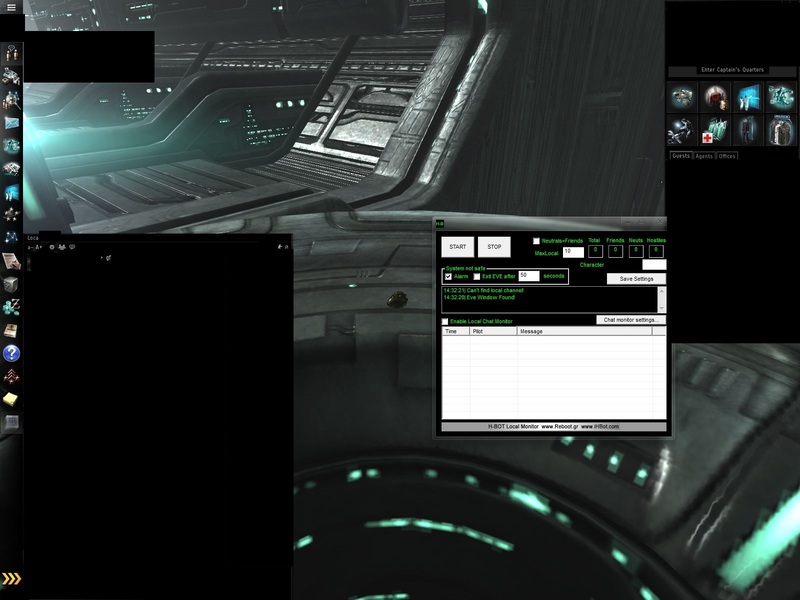 Before using H-Bot LocMon you have to do some basic settings in eve. 2. Open overview settings and go to APPEARANCE->COLORTAG and move the blue plus boxes (positive standings) to top and uncheck gang, corporation and alliance colortags. Also set standings to your corporation to positive. You can do that from people and places window. Find your corporation->set standings. Set it to positive. Its not working anymore for me? Is ist because of the small Patch? My problem ist that it says now always 1 Hostile and 11 friendly in evry system, even if theres noone there. Locmon works fine. Make sure colors are set to 0.0.0 and transp to 255 in eve. Send me a screenshot if you can't find the problem. I'm very bad speak in English and use of translation software. Therefore I ask for errors to throw tomatoes in the program Google Translate! Essentially: Your program can work in a system of two monitors on a second monitor? How to make this work? I tried. It did not work. Here is a screen. Locmon works great, but is there a way I can either make separate instances of the program monitor different eve windows (or I guess just trick it into monitoring 2 local windows at once)? If I set someone on the first client red, locmon screams at me just like it should. If I set them red on the second, nothing (surprise!). Strangely enough, the local chat monitor will actually read what's said in each eve client, but it doesn't scan the second client for standings. e: To clarify things a little, my setup looks strange because I'm using isboxer. I think locmon just thinks that my second client's local window is a secondary chat window of the first client or something. e2: I doubt you want to bother with it, but an option to select which client gets monitored would be really awesome. If you input your char name in the character field it should monitor that local for hostiles. Oh, I am a huge retard. I didn't realize it was scanning by program title, so when it didn't work I just assumed it was just there for save data or something. Thanks. Just in case anyone else has this issue in the future. ISBoxer changes program titles, which is what locmon uses to figure out what it is that you want to monitor. 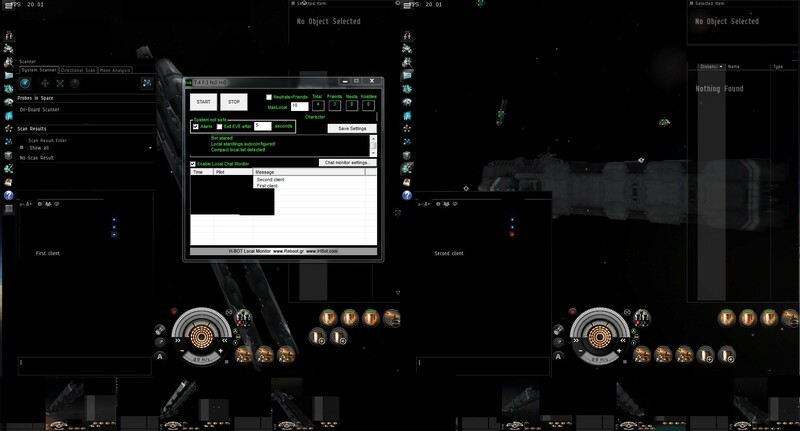 The format for a proper eve client is something like "Eve - Pilotname". ISBoxer, at least in my case, uses "IS1 (CTRL + ALT + 1) Pilot1name". So if your setup is in a normal format like most people then locmon works just fine if you give it a character name. If you're using some special snowflake setup like myself, then you're going to need to use the new program title in the character field. For me that would be "IS1 (CTRL + ALT + 1) Pilot1name" and "IS2 (CTRL + ALT + 2) Pilot2name"
It's a pretty simple fix, and works great. edit: Turns out you need to start locmon with no special settings, stop it, input the new program title, and then start it again. Doesn't seem to be working for me. Tried it that size, smaller size, with a group of other chats. Any ideas on what the problem could be? Any suggestions? Try making the local little smaller. Send me a high quality screenshot to support@reboot.gr and I'll check it on pixel lvl and tell you what's wrong. To make a high quality screenshot go to eve general settings and check the according box. Yes ofc. Isn't it working for you? can you relink an image for set up? Local is on the left side, it's non transparent and settings are changed. But get that "can't find local channel! thing. Anything what i am missing? 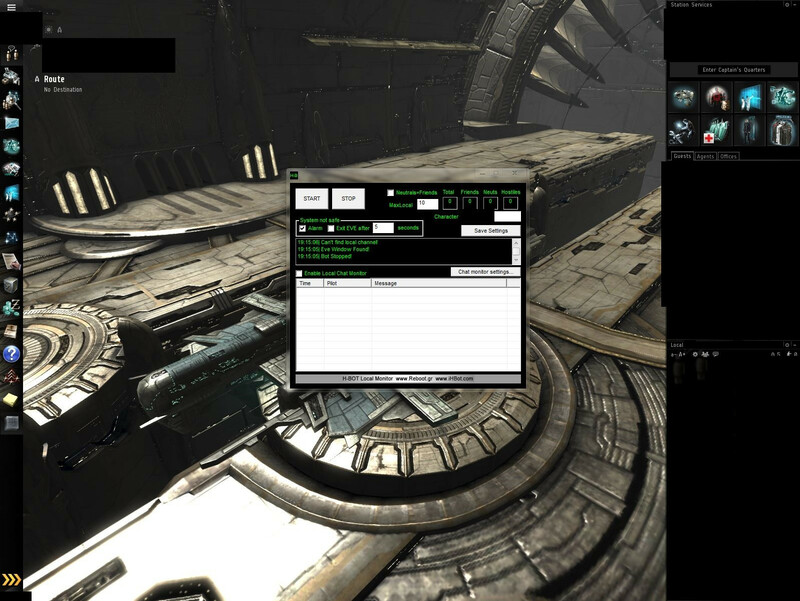 Ok moved eve client from the second monitor to the first one, it works now. Is it possible to use it on the second screen? Would it be possible to change the amount of times the alarm sounds or increase the interval of repeats to lets say 1 or 2 minutes? I tried to create a new alarm.wav and added 1 minute of silence to the file, but it seems it just restarts the wav every x second and does not play the entire wav. i try reinstall, i try change the windows, Resize! i try ALL for days! http://prntscr.com/3u2cym that is the screenshot, i dont know how more i can do! please help me! thanks!